So smoked salt just seems right. Don’t you think? When I ordered this jar of Danish smoked salt, I had NO idea what I would do with it. I was thinking – Tofu? Soba? Then I saw a picture of potato salad, and I immediately knew it! The creamy mayonnaise, with the garlic, really complements the smokey flavour. Cut up the potatoes into bite-sized chunks and boil in unsalted water until tender. Drain and leave to cool. Mix together all the other ingredients except the parsley, then add to the cooled potatoes. Stir well and finally add the chopped parsley. I prefer this at room temperature, but you could try it chilled too. Delicious with grilled cheese and tomato salad! Any other ideas what I could do with my smoked salt? This entry was posted in Food, Herbs & Spices, Recipes, Vegetarianism and tagged Food, Herbs, Recipes, Spices, Vegetarian. Bookmark the permalink. Oh dear, for you that may sound good, but for a vegetarian…..
Oh I agree salmon would be yummy or even sausages…sounds so delicious. 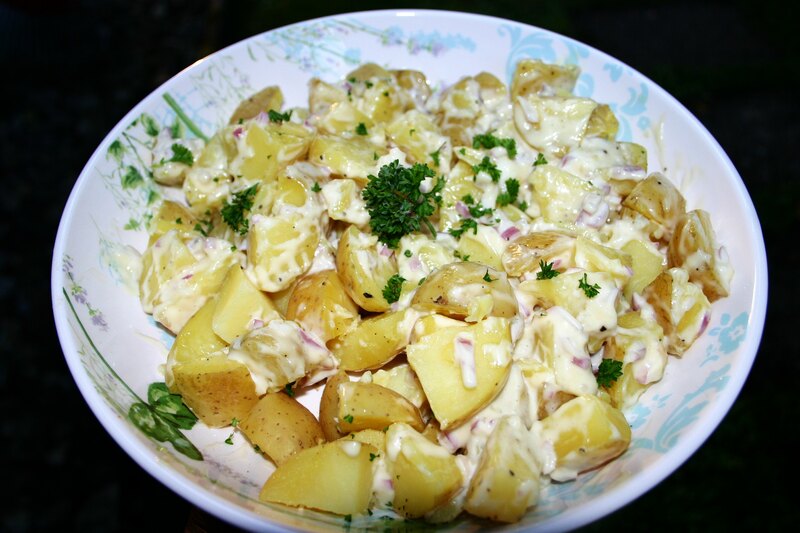 The Bavarian potato salad is quite different – no mayonnaise and lots of sour vinegar! (I don’t like it much). But in the north of Germany they use mayonnaise too sometimes. I like malt vinegar on fries (chips) too! 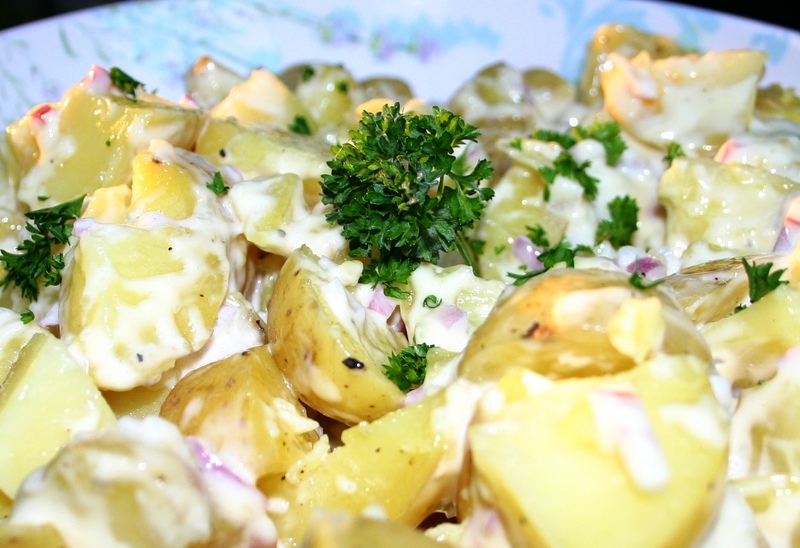 But not in potato salad… Strangely enough the Germans love it in salad but not on fries! 😉 Must be a cultural thing! LOL! I have that salt but never thought of it in potato salad!!! yummy!!! Now you know Sharon… 😉 Thanks for commenting! Very interesting. I live in an area with many saltmines. In former times the “white gold” brought wealth. Smoked salt was nwe to me. We do potato slices over night in a liquid of vinegar, sugar, onions. The next day, let them dry and finish with self made or bought mayonnaise. That potato salad sounds good. 😀 The Bavarians also add sugar to anything that has vinegar in it. 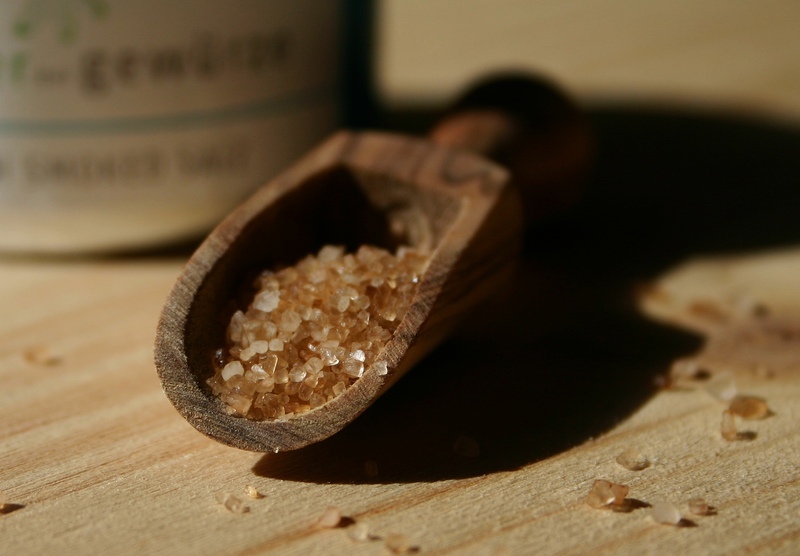 I haven’t come across smoked salt before – how strong is the smoked flavour? I will look for some smoked salt, in the meantime I’m planning to try your potato salad with ‘normal’ salt, it looks delicious! I’ve heard about smoked salt before but never tried it. I’m imagining it tasted great with the potato salad, but like you would love to hear other ideas (veggie ones) too !! A lovely post cathy with the touch of hstory and centred on your area too. Thanks Claire – I’ve seen smoked salt on amazon (uk). And I’m working on another recipe with it! Very interesting! I´ve never heard about smoked salt and probably loads of other spices. I think the salt could be good in sauerkraut. I always use a stockcube but for you as a vegetarian this could be an alternative. Could also be good for cooked vegetables or scrambled eggs? And again the Germans can´t live without English. 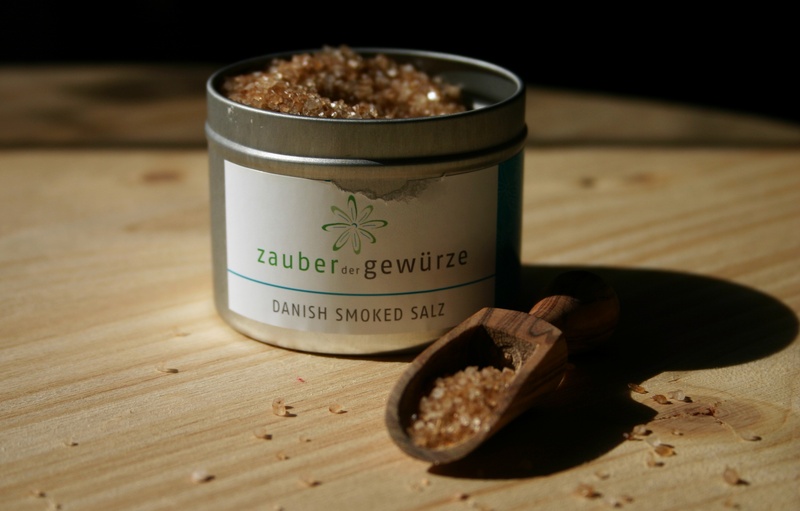 “Danish smoked salz? ?” ….. I might try it with eggs – thanks! Yes, the label says it all! LOL! My hubby and I love potato salad and I make it several different ways…I have to try out this version! I was just at the organic grocery today and they had a whole bunch of different types of salt. I don’t recall if they had smoked, but I’m sure I can track some down somewhere. This looks delicious!